Inland Empire residents with an interest in sustainable food systems and locally grown food have the opportunity to learn about local agriculture initiatives at the GrowRIVERSIDE conference. UC Riverside on Monday, March 21, 2016. Tickets range in price from $55 to $90. The knowledge and tools required to create local food systems. Economic development and community engagement. Public policy related to food and agriculture. Research projects conducted by undergraduate and graduate students. Served by the Riverside Unified School District’s nutrition program, a leader in Farm-to-School Programs. Learn more about the history of GrowRIVERSIDE and the history of Riverside’s urban agriculture movement at Seedstock. Seedstock is a social venture fostering the development of local food systems and helped to plan the first two GrowRIVERSIDE conferences. Plants, Life, Riverside is an interpretive project about plants in an urban environment. Where are the plants in Riverside? Let’s find out. When living in an urban environment it is easy to ignore nature, even when we do encounter it within our city limits. A flattened opossum on the road isn’t nature. It’s roadkill. That Venus flytrap at the cash register isn’t a plant. It’s a novelty item that will be dead in two weeks. And that coyote dodging traffic? Well, he is just crazy! Is there enough “nature” in the urban landscape to warrant spending a lot of time on environmental education? Dr. Katie Lynn Crosley says there most definitely is, however, ​to be successful, environmental educators need to address certain issues. Crosley discusses these issues and presents a solution in Advancing the Boundaries of Urban Environmental Education through the Food Justice Movement. Environmental education’s strong affiliation with wilderness and non-urban environments. Environmental education’s strong association with the lecture-based pedagogies of the science classroom. The lack of attention the field of environmental education gives to issues related to race, culture, politics and economics. Crosley (2013) explains that urban learners often view science as “irrelevant to their lives or identities.” This is a problem for environmental education (EE). Crowley (2013) suggests that environmental education needs to stop being a sub-component of the field of science. She goes on to say that other avenues need to be explored because staying within a field with rigid “scientific ways of knowing” (Crosley, 2013) limits the field’s ability to address social and cultural issues not usually addressed in traditional science education. To make the field more culturally responsive, Crosley (2013) proposes integrating environmental education with the food justice movement. Crosley (2013) proposes integrating EE with food justice because doing so shifts the focus from non-urban wilderness and science education to food, a subject more meaningful to urban audiences. Food is a part of everyone’s identity and is “applicable to human-dominated landscapes” (Crosley, 2013). Wilderness is not. In a global economy that supports over 6 billion humans, the entire concept of nature or ‘wilderness’ as a pristine exterior is a romantic and potentially dangerous fiction that denies reality. What does food justice have to do with ArtPlantae’s mission of encouraging an interest in plants? Food security is one of the fields discussed in the Botanical Capacity Project as being at risk in light of fewer colleges offering coursework and degrees in botany and in light of fewer people expressing interest in the plant sciences. If you recall from my previous article about this project, the Chicago Botanic Garden, the U.S. Office​ of Botanic Gardens Conservation International and several partners conducted a one-year project to assess the weaknesses of plant science education, research, and habitat management in the United States. These organizations identified gaps in society’s ability to manage issues in which plants play a role. Issues such as climate change, biodiversity, biofuel production and food security. I think Crosley’s proposal is relevant to this conversation and this is why I have chosen it to launch the Plants Everyday column. Unlike the art-specific and location-specific columns I write, this column will feature the casual ways plants weave in and out of our lives, whether we think about plants everyday or not. To learn more about Dr. Crosley’s proposal and to learn more about the history of environmental education and the food justice movement, download her article. Crosley, K. (2013). Advancing the boundaries of urban environmental education through the food justice movement. Canadian Journal of Environmental Education, 18: 46-58. Moffatt, S. & Kohler, N. (2008). Conceptualizing the built environment as a social-ecological system. Building Research & Information, 36(3):248-268. The community garden at UC Riverside has announced their schedule for Fall garden workshops and solar-powered movie nights. They have also announced that there are some plots available in the garden. Students, staff, faculty and the public can be plot holders. If you’re interested, contact R’Garden, UCR’s Community Garden. 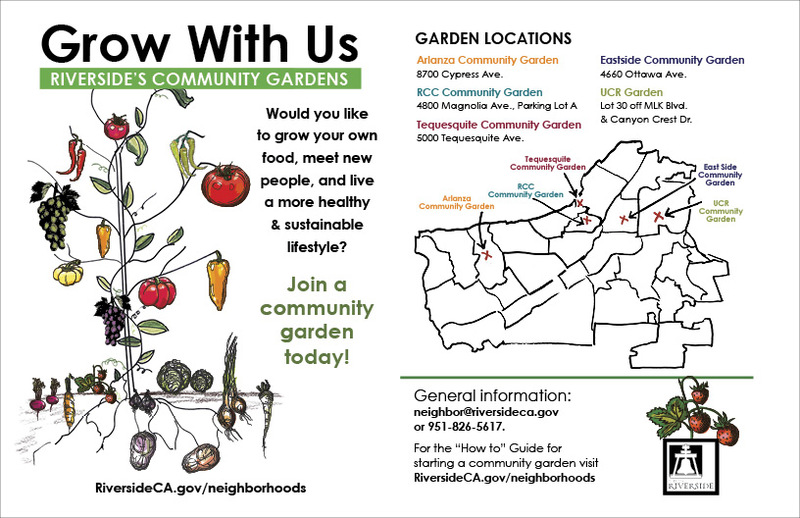 Learn more about R’Garden and all of Riverside’s wonderful community gardens. Download the flyers below. Plants, Life, Riverside is an ongoing interpretive project about plants in the bustling urban landscape of Riverside, CA. In the urban landscape we are surrounded by plants. When talking about plants in this environment, we tend to use very general labels (e.g., street tree and patio tree). In today’s Plants, Life, Riverside column we focus on another group of plants with a vague name — houseplants. Houseplants may be the least exciting plants we encounter in everyday life. Unfortunately that expression “seen one, seen them all” kind of fits in their case. But did you know houseplants contribute much to your well-being? Houseplants are fascinating in their own right because of the role they play in improving indoor air quality. This information comes to us from the National Aeronautics Space Administration’s (NASA) research into creating livable environments in space. Thanks to NASA and the work of international research teams, we have a better understanding of how plants in built environments improve indoor air quality. A positive effect on the physiological and psychological well-being of people occupying built spaces. A positive effect on recovering patients. A positive effect on worker productivity. Wolverton and Takenaka discuss indoor and outdoor air quality, volatile organic chemicals in built environments, and the purification abilities of plants in the first half of their book. Wolverton and Takenaka (2010) have many years’ experience studying indoor and outdoor environments. Dr. B.C. “Bill” Wolverton is a retired NASA scientist and has received patents and awards for his research into environmental pollution. He is the author of How to Grow Fresh Air (1997) and Growing Clean Water – Nature’s Solution to Water Pollution (out of print). Kozaburo Takenaka is the founder of Takenaka Garden Afforestation, the top plant leasing company in Japan. Takenaka has created green environments in indoor and outdoor spaces and has researched green plant-related technologies. In their book Wolverton and Takenaka also discuss rooftop gardening, vegetable gardening, commercial crop production, medicinal plants, aromatherapy and phytoremediation (the use of plants in waste filtration). 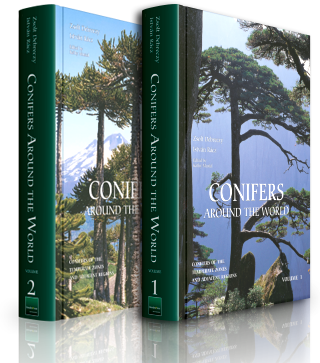 To guide the reader through these topics, the authors include a glossary of terms and a bibliography of interesting articles and resources in the back of their book. Plants: Why You Can’t Live Without Them can be purchased online from your local independent bookstore. Wolverton, B.C. and John D. Wolverton. 2001. Growing Clean Water: Nature’s Solution to Water Pollution. Picayune, MS: WES, Inc. Encourage an interest in plants and locally-grown food with this one-of-a-kind coloring book. The coloring book, Colorful Edibles, was the brainstorm idea of botanical artist and organic farm owner, Wendy Hollender. Grounded in a desire to promote the work of the American Society of Botanical Artists (ASBA), a small committee formed to raise awareness about the ASBA through the development and sale of products created by its members. It took about one year for the first idea, a coloring book, to take shape. Botanical illustrator Bobbi Angell signed on as Co-Project Coordinator and Editor. Graphic artist and book designer, Charlotte Staub Thomas, also joined the project. Together they created a coloring book highlighting the contemporary botanical art of 26 ASBA members. Editor, Bobbi Angell, says it was easy to get artists involved in this project. The project team made a specific request for pen-and-ink illustrations so that they could include as many ASBA artists as possible. They received 85 submissions from 38 artists. Because they wanted to keep the book inexpensive, only 36 illustrations were selected. The illustrations in Colorful Edibles showcase the strong and diverse line work of ASBA members, and includes work from new artists alongside​ work by more established artists, things Angell said the project team was hoping to do. Most pages of the coloring book feature a full-page illustration. Informative passages about each fruit and vegetable are included on each page. Angell wrote the passages with young readers in mind. Through her writing, Angell makes reference to the origin and domestication of each fruit and vegetable so that readers learn about the history of their food. She also includes comments from contributing artists. Colorful Edibles is truly a coloring book for all ages. Garden teachers will find this activity book to be a helpful teaching tool because it not only explains where familiar fruit and vegetables come from, it touches upon the subjects of botany, history, agriculture and nutrition. The project team hopes to expand the coloring book format to other books about native plants and wildflowers. Colorful Edibles is sold by the American Society of Botanical Artists. The second annual GrowRIVERSIDE conference is only two weeks away! If you’ve been wanting to strengthen the local food and urban agriculture infrastructure in your community and don’t have a clue about how to begin, do not miss the second annual GrowRIVERSIDE conference. The conference will be held at the Riverside Convention Center, June 11-13, 2015. At the inaugural conference last year, the City of Riverside was in the early stages of establishing relationships between local growers, the urban agriculture community, policy makers, investors and Riverside residents. Now one year later, the community-led Riverside Food Systems Alliance is in place and working to promote sustainable agriculture and an economically viable food system in Riverside and neighboring communities. Attend GrowRiverside: The Future of Local Food (June 11-13, 2015) to learn more about this new Alliance and to network with growers, entrepreneurs, policy makers, investors, Riverside residents, and students pursuing careers in sustainable and start-up agriculture. View the complete program at GrowRiverside.com. A free Community Farm Fest will be held on Saturday, June 13 in downtown Riverside near the weekly farmers market. Ask a Farmer: What is Community Supported Agriculture? Click on the image above to download a Community Farm Fest flyer to share with family and friends. The flyer is printed in English and Spanish. Communities are filled with avid gardeners and you may be one yourself. Home gardens and community gardens are scattered all over the country. On an individual basis, they don’t appear to do much to affect the ecology of a region. Collectively, their environmental impact on a region is unclear. What type of impact could disconnected gardens possibly have in a neighborhood, city or region? It’s a big question to think about and one that plant ecologist,Cara Fertitta is tackling head-on in her research at University of California Riverside. Working with gardeners and small scale farmers, Cara has started to measure the impact gardens have in the urban landscapes of Riverside and Los Angeles. She visits with us today to discuss her research. Please join me in welcoming Cara Fertitta! Cara, thank you for introducing yourself at a recent meeting of the Riverside Community Garden Council. Tell us about yourself. I’m currently a third year graduate student at the University of California Riverside pursuing my PhD in plant ecology. I’ve lived here in Riverside for about 4 ½ years. I made the move after graduating with a B.S. in biology from the University of South Carolina in 2010. I was pretty sure at that point that I wanted to pursue graduate school, but I had recently made a few major directional changes, so I decided to take some time off in between. In those intermediate years I actually had a really interesting job working as a baker for a tiny little artisan sourdough bakery (Now the not-so-tiny Rustic Loaf of Upland). I would go bake bread in the morning with my boss in a tiny little commercial kitchen space, and then head out to farmer’s markets to sell. It was a great experience. At the same time I was getting really passionate about gardening and increasingly invested in cooking and sustaining a homemade pantry. Being involved in the farmer’s market scene was a constant inspiration and connected me to a lot of local farmers. Originally I’m from Massachusetts — the youngest of four daughters in a stereotypically large, traditional Italian-Sicilian family. I remember gardening and cooking with my mother at a very young age, so these seeds, so-to-speak, where planted early. My enthusiasm for science didn’t arise until high school. About the time I started learning biology, anatomy, and physiology, I was hooked. Discovering my passion for ecology took longer — I had little appreciation for it until my later years of college, but at some point it just seemed to click with me as the most fascinating science. The science of how things interact with each other and the environment — I mean, how cool is that? As a nature buff, gardener, and food enthusiast, the rest unfolded quite naturally. Your project is very interesting. Would you mind telling readers about your research? My project is investigating the productivity, efficiency, and sustainability of small-scale, local food systems ranging from community gardens to small farms. There are a growing number of gardens and small farms popping up across the country, particularly in urban areas. Over a third of American households are participating in some form of food production, yet we have almost no data quantifying how productive small scale systems are and how they compare to large scale production systems. Further, we have very limited data on how gardeners and small farmers are using their space and resources, and what implications this has for their overall sustainability. Although these systems are small, they stand to have substantial impacts on the environment, particularly in urban regions where they are very much integrated into the community. I’m hoping to get a better picture on what gardeners are doing, and use that to quantify the impact of these practices on the environment. I hope this research will help gardeners better manage their resources and reduce waste. Why is productivity of small-scale gardens of interest to you? How did you come to research this topic? This subject is interesting to me from both a scientific and personal perspective. This research will be the focus of my dissertation for my PhD in plant ecology. My scientific interests have long been focused on the overlap between plant community ecology and agroecology (i.e. agricultural ecosystems). Integrating ecological principles at the large-scale is often quite challenging due to the reliance on very standardized heavy machinery. At the small-scale, people often incorporate ecologically-friendly practices without even realizing it — planting densely and diversely and relaying primarily on renewable human labor, which could represent a substantial advantage in sustainability, but that’s not to say that large-scale systems don’t have certain advantages as well. At the personal level, I’m interested because I am a small-scale producer and supporter myself. I’m a very avid and enthusiastic gardener and I’m also a big proponent of home-cooking with an emphasis on seasonal, locally-sourced (if not homegrown) produce. I love gardening because it connects me to both the food I eat and to the environment I live in. When I’m planting and landscaping, I’m also watching the migration of different birds, seeing which pollinators visit what, watching the soil biota shift as I introduce compost to the soil. It’s a fascinating endeavor as both a person and a scientist and I’m very interested to see the results of this study. How many home gardens are in your data set? How many community gardens? Well our gardener recruitment is an ongoing process. Currently I have 11 different gardens throughout Riverside and LA committed to the study, but I’m always happy to have more. I was initially planning to sample some home gardens as well, but since space and spatial limitation is such an important aspect of this study, we decided that using community garden plots would be more conducive to the study’s objectives. While some home gardens are contained, many of them are sprawling or disjointed. There doesn’t tend to be distinct spatial boundaries in a yard and spatial boundaries are key to my study. You’ve mentioned that you hope your research will “influence policy decisions that may improve land tenure and public support for community gardens by showing their value in food production and sustainability.” What do you hope your research will do for home gardens? I think for home gardens, the most important take away from this research will be regarding resource use efficiency (meaning yield output per resource input) and sustainability. I’m using a modeling technique to assess sustainability in terms of environmental impacts ranging from air and water pollution, to green house gas emissions, to human health impacts. Gardens pose many opportunities to be more productive and efficient forms of agriculture than large-scale production. They use voluntary, renewable labor, they incorporate a lot of diversity (which is beneficial for nutrient and water retention, prevention of pest, disease, and weed outbreaks, and attraction of pollinators), and much like a natural environment they leave little unoccupied space and they plant creatively (e.g. like using vertical space along horizontal space — think trellising). But there’s a good chance many gardeners are overusing their resources. Studies of lawns show widespread over-use of fertilizers, pesticides, water, etc., and it’s likely this extends to many gardeners as well. Overuse of resources is not only a waste, it can be extremely damaging to the environment — particularly when it comes to agrochemical use. In organic gardens, the resources themselves are often much lower-impact, but getting the timing and composition of compost in balance can be quite a challenge. I’m hoping to get a better picture on what gardeners are doing, and use that to quantify the impact of these practices on the environment. I hope this research will help gardeners better manage their resources and reduce waste. Many people garden in small spaces or do container gardening on patios and balconies. How might your research be applicable to this group of people? These folks really represent the smallest of small on the spatial limitation spectrum, and my hats off to them to using whatever space they can. Their use of space is often very creative and exploitive, which has the potential to equate to very high productivity (productivity here meaning yield normalized by space). However, properly managing resources in these container gardens is very tricky. The drainage and the shallow depth of most containers makes balancing water and nutrient needs a challenge which could result in reduced productivity and in most cases likely result in reduced resource use efficiency. Since my research will be working with folks that are planting in the ground, I’m afraid it may not be terribly insightful for container gardeners. I think that would really require a study of its own. There is a nice collection of resources by the National Gardening Association that can be used in the classroom. Do you plan to develop instructional material for community gardens, school gardens and home gardens in the future? I think there’s potential for the development of some helpful reference materials, but it’s not something I’ve considered yet. We do, however, plan to hold one-on-one consultations with all interested participants as well as a couple of public workshops co-sponsored by UCR’s agricultural Extension program. Will you be presenting at the Grow Riverside conference in June? I’m not planning to present this June since I will still be in the data collection phase. Next summer, however, I should have a lot more worth talking about. If you would like to follow Cara’s progress, periodic updates will be posted to the University of California Division of Agriculture and Natural Resources Extension’s Urban Agriculture Blog. Subscribe to their blog here. The City of Riverside is experiencing a renaissance when it comes to local agriculture. This growing interest is fueled by passionate Riverside residents, community organizations such as the Riverside Community Garden Council, Sustain Riverside, and the City’s partnership with Seedstock to create GrowRIVERSIDE, a program establishing a sustainable food and agriculture system throughout the city. Also, be sure to follow Cara’s research into the productivity, resource use and environmental impact of urban gardens. You can follow Cara’s progress by subscribing to the urban agriculture blog maintained by the University of California. What a way to introduce students to ecology! 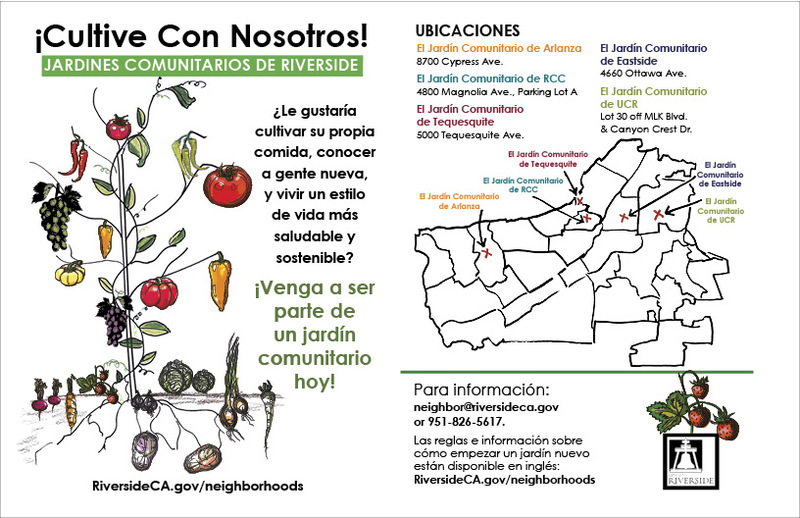 Riverside residents are invited to download a map to local community gardens created by the City of Riverside Community Development Department (see right). This map is available in English and in Spanish. Plants, Life, Riverside is an interpretive project about plants in an urban setting. Where are the plants in Riverside? Let’s find out.